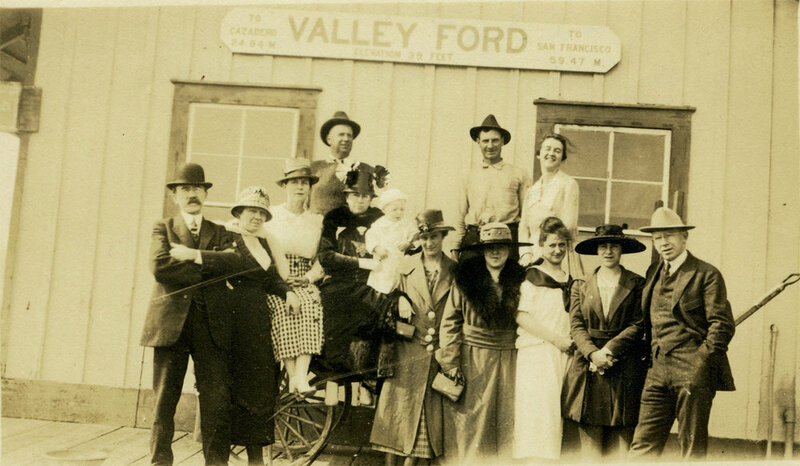 A well-dressed crowd poses at the Valley Ford railroad depot, circa early 20th century. By becoming a member of the Tomales Regional History Center you are adding your voice and your support to our organization and its mission — indeed your membership makes you a part of TRHC, and you are always encouraged to keep in touch with us. With your membership, our quarterly Bulletin will arrive in your mailbox each season, full of stories and images telling of the Shoreline Region’s history, and keeping you up-to-date about TRHC’s activity, including news of our museum’s latest acquisitions, exhibits, and programs. We hope that this publication brings us together in our interest in — and especially in our connection with — this Shoreline Region’s past. Yearly membership dues are $20 for individual members and $25 for family membership. Life membership is a one-time contribution of $250. To become a member of the Tomales Regional History Center, or to renew your annual membership, click the button below and complete the form. You will need an email address and a credit card to make an online donation.